Italians have a reputation for being fashionable and let me tell you that they have not let me down. They are always well-groomed and prepared to look good for the day when they venture out into the Italian streets. I agree with the sentiments I’ve heard that Italians are partial to black and neutrals because almost every single jacket I see here is black. However, as I see the spring trends creep into the beautiful windows along the major shopping streets, I see bursts of spring colors like teal, peach, and yellow and I have an inkling that Italians style may begin to bloom when it warms up. After being in Italy for a week I’m already worn just about everything I’ve brought, save for a few dresses just aren’t warm enough for the chilly weather we have been having the past few days. I’m beginning to analyze the things that I’ve brought and wondering if they accurately reflect who I am. I’ve brought with me one of my favorite dresses which is full of bright colors, but after seeing all of the black here I feel like the dress screams “HELLO I AM AMERICAN!” rather than my usual, “Hello! 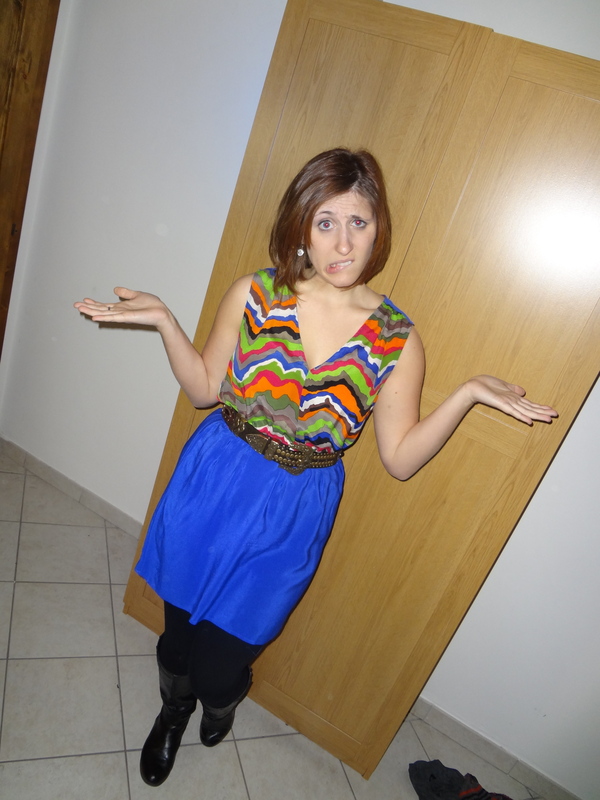 I am quite wonderful and fun!” But in reality, this dress really does represent me, but I feel like if I want to fit in with the Italian fashion, I’ll need to sacrifice a part of me (the loud, outrageous part) that often is shown in my clothing choices. When I bought this dress I immediately knew that I wanted to wear it when I went out because it’s a very lively dress and I wanted to tell people that I’m fun. But here I feel like it would seem like I’m screaming for attention in a negative way. I’ve always dressed in a way that reflects who I am or who I want people to think I am. I’ve always chosen clothes that I’m drawn to which are usually bright colors, fun patterns, or basic pieces that I can mix and match with my loud accessories. These clothes, in addition to my outgoing personality, create a persona which many people describe as colorful. Even in middle school, I would dress in different themes every day depending on my inspiration, which could range from ballet to hippie to punk rock. 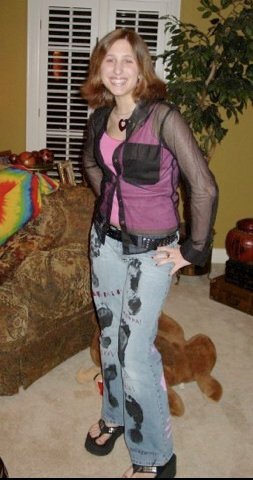 In 7th grade, I even made my own pair of jeans and planned an entire outfit around my two favorite colors, black and hot pink . Ignoring my horrible haircut, this outfit was pretty in style at the time for my middle school. Even though looking back makes me cringe, I remember feeling so confident and in charge of my style that I didn’t care. I’ve always identified myself through my clothing so I often believe that others practice the same thing and therefore I often judge a person based on their wardrobe. However, through my new experience with a limited wardrobe, I understand that there are limitations people face with their closets. Budget, practicality issues, and environment are all issues that people face when they get dressed in the morning. Clothing choices are simply about choosing which persona you want to exhibit that day, sometimes you are dressing to fit into a certain environment or layering on several shirts that may not match because its so incredibly cold outside you don’t care. Every fashion choice we make reflects more than just our personality, it reflects the choices we make for our day. I still believe in the idea of communicating through our fashion choices but I also believe that clothing was created for a purpose and for most people they still function with a purpose of clothing our bodies. But I’ll still live my life wearing adorable clothes that fulfill the same purpose. Also, for girls who are dying to know about the shopping scene in Florence, it’s incredible! The stores range from cheap to affordable to expensive. H&M and Zara are always crazy busy, but I bought a ton of great clothes for a reasonable price including a trench coat for only 20 euro! There are also a lot of cute boutique stores that are a little pricier but have different unique clothes. *TIP: In the middle of February, almost every store in Florence has MASSIVE MARKDOWN SALES where almost everything is 50% off so you can get great deals on early spring merchandise and winter wear. I’m planning on hitting the stores tomorrow during my break tomorrow. I’ll post later about the best stores to hit when in Florence.